Folk medicine at its best with the blood red oil of St. Johnswort. Nerve, joint and muscle pain can be associated with either an acute or a chronic condition. Using a muscle in an unaccustomed manner can result in a strain or a sprain. The difference between the two is a sprain occurs at the joints when ligaments are overstretched. Strains are when the muscles or the tendons that hold the muscles are torn or pulled too hard. Whatever the cause it is usually inevitable that following an acute injury, pain, swelling and limitation of function will follow. The most immediate thing to do is the RICE treatment which is rest, ice, compression and elevation. Any concerns as to the severity of the damage should be appeased by a visit to your physician. Once released to your own means of healing an herbal anti-inflammatory liniment can be very effective at relieving the swelling, discoloration and pain. Neuralgia or nerve pain can be caused by pressure on the nerve as a result of an injury, nerve damage from diabetes or from what is termed Repetitive Strain Syndrome. This covers a wide range of conditions which develop as a result of doing the same motions continuously to the point of damaging muscles and joints. Without treatment and a change in the way we work, RSS can become a chronic condition. Chronic pain is usually something we just have to manage. Conditions without a known cure can rely on herbal remedies to help improve one's quality of life. Perhaps not as strong as prescription drugs in relieving pain, at least you won't have to deal with addictive or mind dulling side effects. Herbs and essential oils are like a team of allies who all help out using their own attributes. They help heal your nervous system rather than only suppressing the pain. 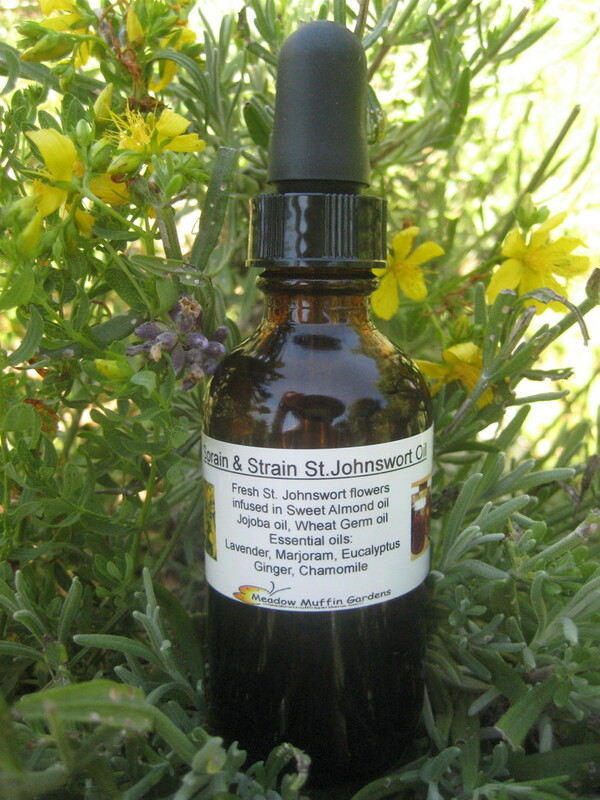 The chosen herb for this oil base is a yellow wayside wildflower called St. Johnswort. Named after John the Baptist, this flower is sought out after the summer solstice. After a two month infusion period and much anticipation it is ready to offer us its anti-inflammatory, anti-viral, and anti-bacterial benefits. These attributes are from high concentrations of the chemical component, hypericin. 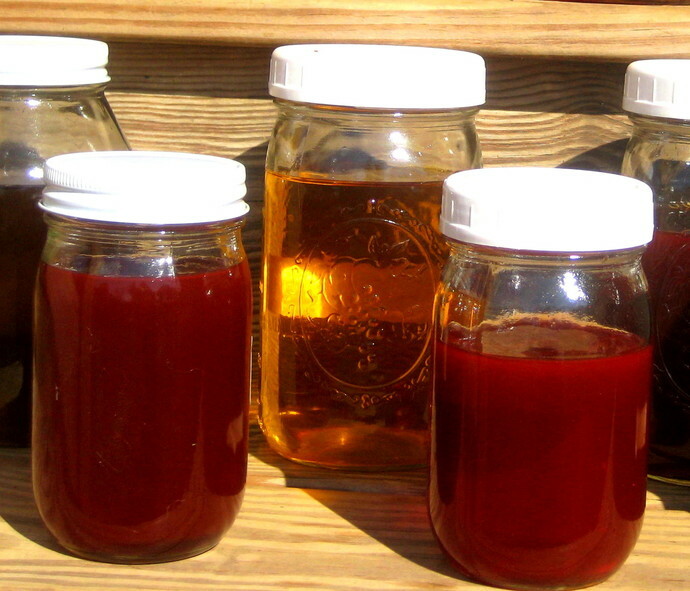 This red juice is what gives the oil its wonderful red color. 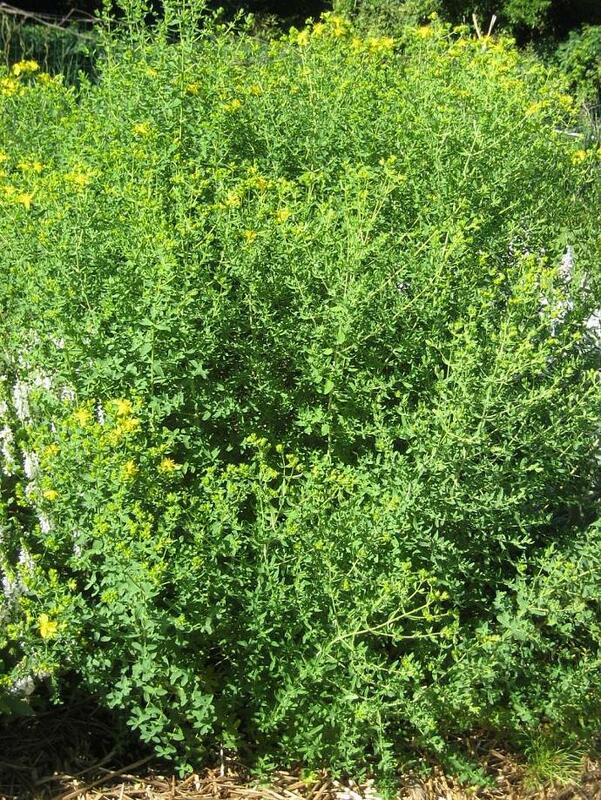 St. Johnswort helps you recover when your nerves are inflamed or damaged because this herb is a nervous system relaxant. For sore, stiff muscles, St. Johnswort acts as a cellular oxygenator that helps remove lactic acid build-up in muscles and can release nerve tension. Chamomile, marjoram, lavender, eucalyptus and ginger are added in the form of essential oils. Ginger is wonderful in that it increases blood circulation for warming the joints and enhances tissue repair. Chamomile serves as an anti-inflammatory and excellent relaxant as it calms and soothes achy muscles and joints. Lavender stimulates healing while at the same time relaxes muscles. A great companion with chamomile. Marjoram is great for tired, stiff muscles and spasms. Definite tonic for the nerves. Eucalyptus is often used for nervous system, muscular and skeletal conditions. It acts as an analgesic for nerves as well as helps to remove toxins in the joints. 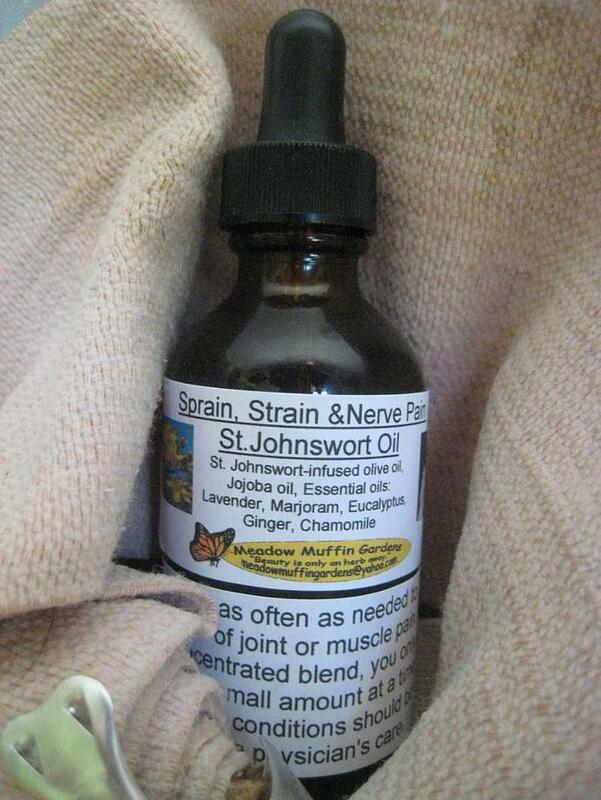 Sprain, Strain & Nerve St. Johnswort Liniment is more potent than typical massage oils. It is bottled in a 2 oz. amber glass dropper bottle. Apply as needed to specified areas. The rubbing action into the skin creates friction, which in turn increases the muscle relaxing sensation of heat. Chronic conditions should be under a physician's supervision.